Beads, Baubles & Jewels series 1900 is packed full of beaded jewelry inspiration and jewelry-making techniques. Our theme is “Make It, Wear It, Love It,” and we present 13 episodes with more than 40 new ideas to try. It’s over six hours of creative infusion! Viewers often tell me that watching the show is like hanging out with your beading friends. Guests include Jean Campbell, Julianna C. Avelar, Jill Wiseman, Barb Switzer, Patti Bullard, Laura Timmons, Kellie Defries, Erin Siegel, and more. Each of them brings a fresh idea or technique, plus, you get to know them a little bit. Whether you queue it up in your studio to make jewelry as you watch, or curl up on the couch to relax with a Sherpa blanket (affiliate link) and take it all in, you won’t want to miss this season of the show. Beads, Baubles & Jewels 1900 is just one of the Bead and Jewelry Workshops you can stream when you subscribe to Interweave’s Online Workshops. This series includes a wide variety of techniques: wire wrapping, knotting, kumihimo, soldering, bead embroidery, bead weaving, looming, wire crochet, embellishing with crystals, making jewelry with leather, and more. I present a variety of projects on the show, including these woven wire-and-bead earrings. I’ve taught these earrings several times and students are always happy with the results. The sparkly Swarovski crystals and metallic wire are stitched in a variation of double-needle weave. Experiment with different sizes and colors of beads to get different looks. Kate Richbourg has appeared on many episodes of Beads, Baubles & Jewels. She’s such an amazing instructor and she brings great ideas to the show. We have a lot of fun! Kate started out in the beading world, got really into metalsmithing, and is beading again at the helm of Beadshop.com. 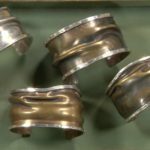 In this series, she shares how to solder a ring and shows us how to make her no-fail bangle bracelet. Kate is the author of Simple Soldering and Metalsmithing Made Easy. 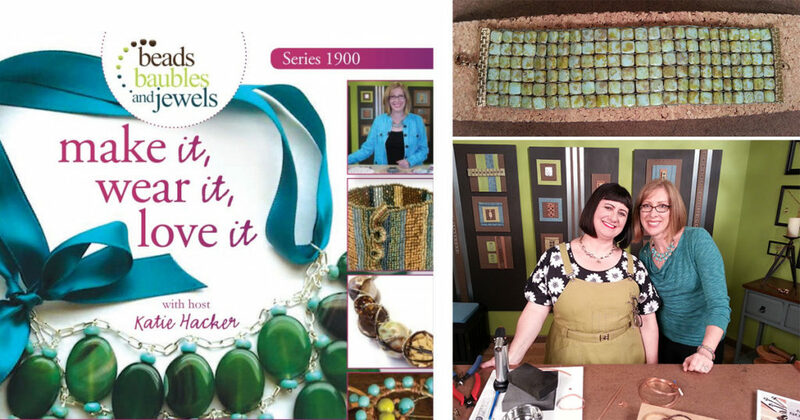 In both books, Kate’s can-do attitude propels you through setting up your studio, getting started, learning essential techniques, and layering your new skills together to make beautiful jewelry. 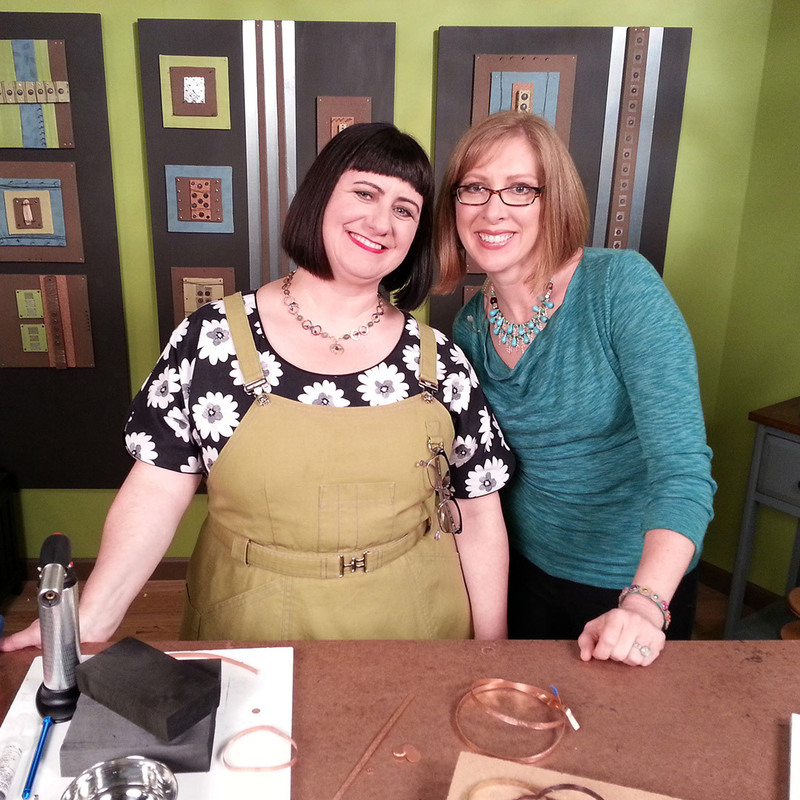 You’ll love the soldering hints that Kate shares on the show. Julianna C. Avelar shows how to use the Jewel Loom using two-hole beads. Jewel Loom inventor Julianna C. Avelar presents several bead looming projects on this series. The loomed mosaic bracelet using square two-hole beads (shown here) is one of my favorites. It fits right into my recent shaped bead obsession. Julianna also presents her take on an affinity bracelet, which is one of her most popular classes. Julianna wrote Jewel Loom Inspirations to share a variety of projects you can make on the Jewel Loom. We love having authors on the show because it’s so fun to dive into the pages and make the beaded jewelry come to life. Julianna’s segments do not disappoint! For extra bead looming tips, read 5 Things I Wish I Knew When I Started Bead Looming. A variety of bead stitches are featured on this season’s episodes. Jennifer VanBenschoten shows how to use a wood block stamp to make a pattern on fabric. Then she embellishes it with bead embroidery (shown here). Jen also demonstrates how to make beaded mandalas that you can connect to create necklaces or bracelets. 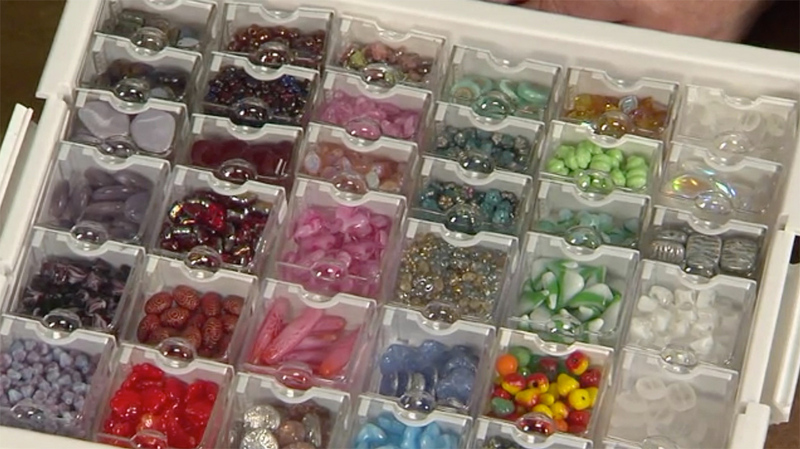 She shows how different types of beads can be used to achieve different textures. 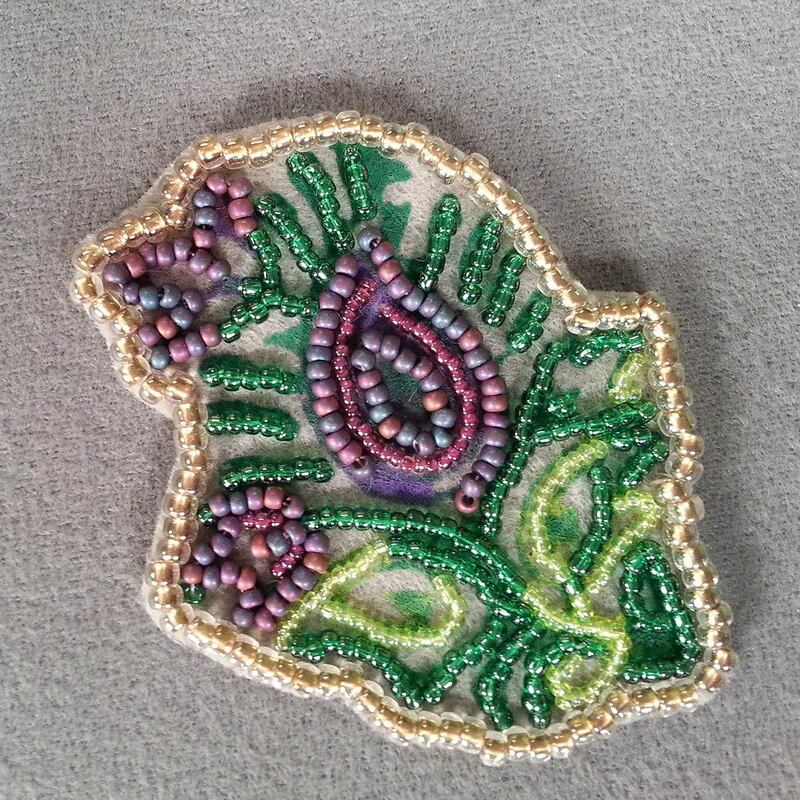 If you’re looking for more seed bead instruction, Jean Campbell demonstrates tubular herringbone stitch, how to shape peyote stitch, flat and circular square stitch, and how to create simple beaded edging. One of my favorite things about our seed beading segments is that the camera gets really close so you can see exactly where the thread path and beads should go. It doesn’t hurt that Jean has a great sense of humor and reminds us to loosen up as we stitch. Bead storage and supply organization is an ongoing battle for most of us and I could wax poetic about all of the different methods I use to sort and store my stash. But, we were lucky to have Elizabeth Ward on the show to talk about Bead Storage Solutions (affiliate link), the system she designed. There are several different trays with different configurations of containers that you can use to organize your beads and supplies. I use these to store seed beads, TierraCast components, and more. They stack perfectly together on the shelves I purchased expressly to contain the trays. For you tool addicts, be sure to watch the episodes with Patti Bullard, creator of Wubbers. Patti shows how important it is to have everything in its place as you embark on a new project. Patti transforms wire into handmade hammered ovals and crafts a bracelet with handmade metal links. Her worktable is a sight to behold. 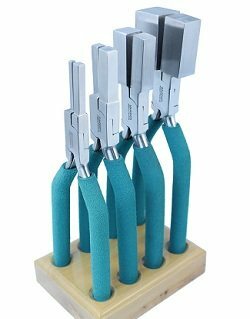 Imagine a dedicated rack for each type of pliers. Heaven! There just aren’t enough hours in the day to make everything I want to make! If you don’t already feel the same, I’m sure you’ll get the bug when you watch Beads, Baubles & Jewels 1900. Join us for jewelry making instruction and creative exploration with all of your favorite authors and instructors. Join us for ideas and inspiration you won’t want to miss!